Stoned Time, with over 7.8K followers, is currently our most popular playlist. "Getting it Now" debuts at #7, which is HUGE for an indie label trying to make it's mark. Jesto Mathis is just below Drake, and Rae Sremmurd; which is crazyl! We captured the #7 spot again on Exitos en Espanol. This playlist has just 771 followers, but Jesto's music gets exposed to a much different audience. Pretty awesome. 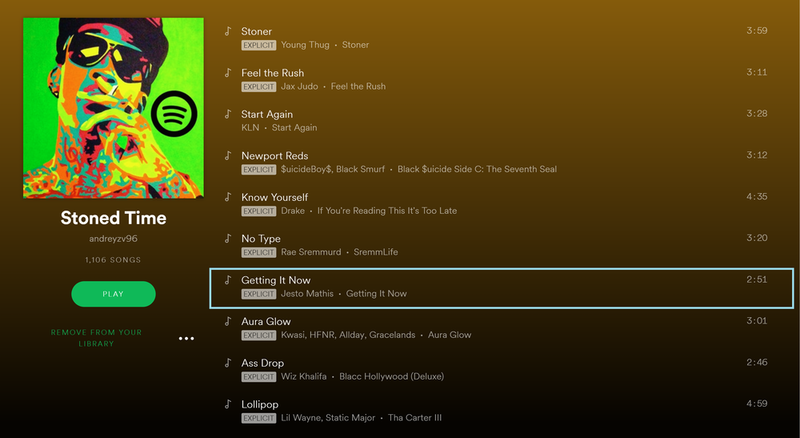 Finally, "Getting It Now" captures the TOP SLOT on the Rap Radio playlist! It's 1,133 follower will hear our song right away, which will help us immensely.